A lot of you may know that we have not had shoes on Fiz at all during the time we have owned him. We have had him trimmed a few times but his feet just do not seem to grow!! Since we will be getting shoes put on him within this month, we have also decided that we are going to put him on the Farrier’s Formula supplement that SmartPak offers. We have heard a lot of wonderful things about how this supplement does wonders for horses hooves in the way of new growth, less cracking, and overall hoof health. Since we plan to show in less than 6 months, and it’s getting close to spring (when hooves can start growing faster due to warmer weather) we feel now is the time to begin this supplement. We do not have experience with it, and we are eager to see how using it will help his hoof quality. In order to document the improvement we hope to see by using this formula and putting Fiz in a set of shoes, we have taken pictures of the current condition of his bare feet and we have also taken measurements of his toe and heel on the fronts. His front right toe is about 3 inches long, and front left about 3.5. 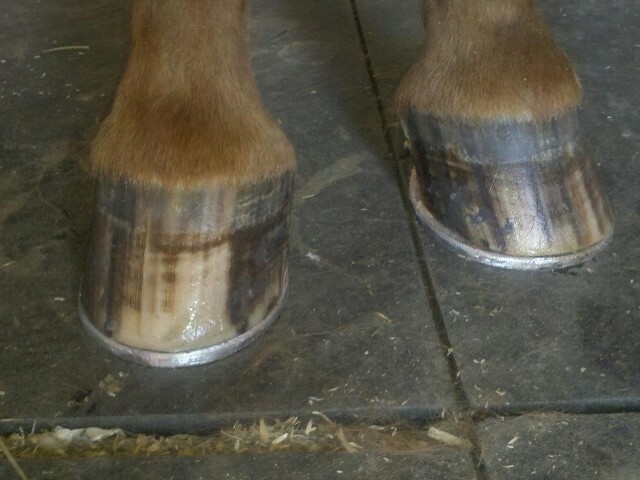 While his heel bulbs are not quite touching the ground, the hoof wall at the heel is not measurable at this time. It is nearly non-existent, which makes us sad! He really needs to have good hoof wall growth in this area to be able to move like we suspect he is capable of. We cannot wait to get his feet in shoes, growing better, and overall healthier. When the farrier puts his shoes on, we will talk about options for showing later on down the road. Exciting stuff!! Also to note, Keratex Hoof Hardner comes highly recommended to us by a friend who uses it on his OTTB mare. Once it warms up, we may try this in addition to the supplement. 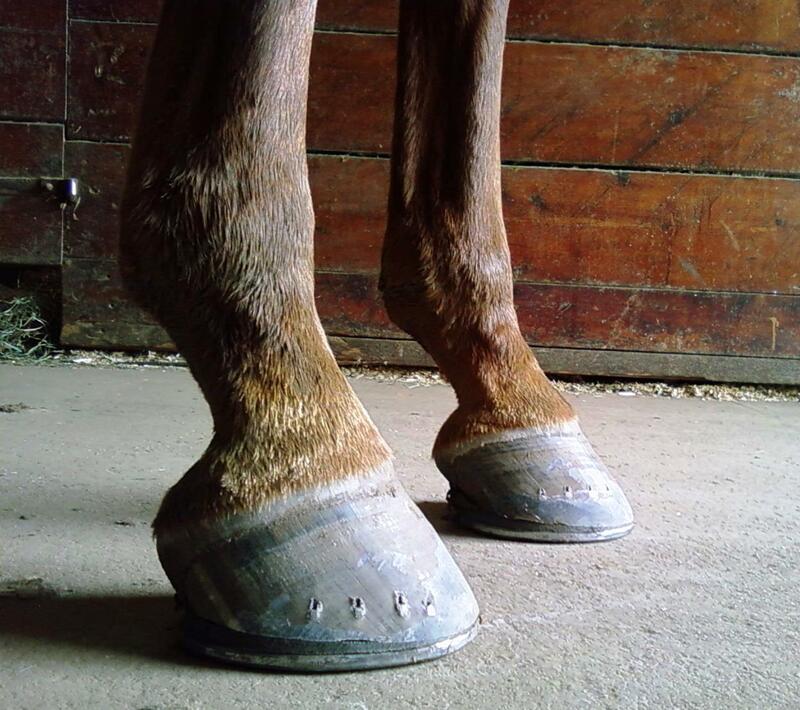 Our friend says he has seen a big improvement in the quality of his mare’s hooves and how she is able to keep shoes on better since he began using this product. 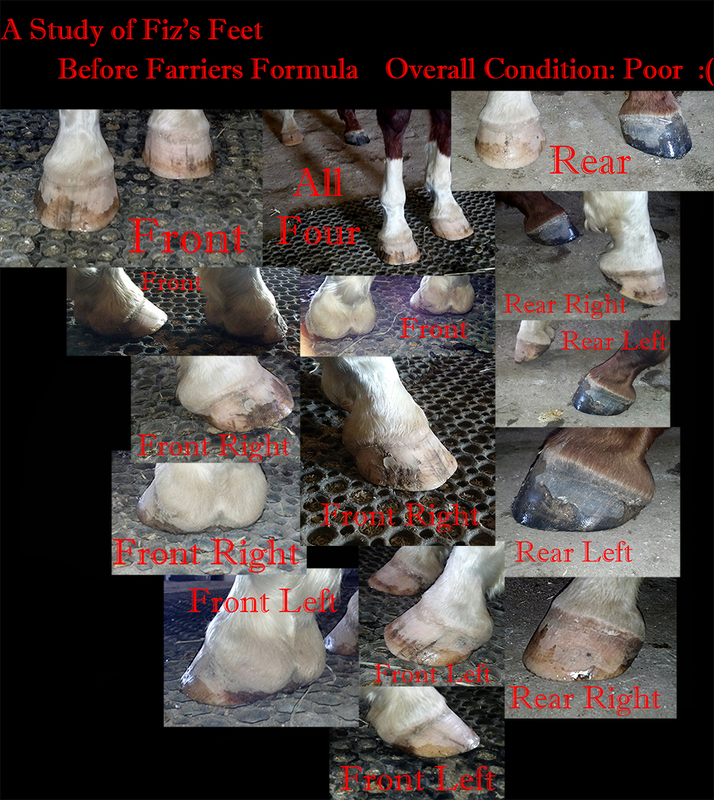 Anyway, here is what we have to document his current hoof condition, which we have analyzed as poor. His rear left hoof is in the best condition, followed by his rear right, the front left, and the front right being in the worst condition. He has a bad habit of pawing with his front feet, so we suspect that is what is causing his front feet to be in such poor condition. We really hope putting shoes on will help keep his feet from getting worn down like they are currently. I realize that some of our readers may not know the difference between a good hoof and a bad hoof, so let me just show you what we are working toward. You can see Fiz’s hooves above, and compare them to these pictures below to see something similar to what our end goal is for his feet.